Senator Bill Cunningham (D-18), Representative Kelly Burke (D-36) and Representative Fran Hurley (D-35) are hosting a Silver Beat Seminar on Wednesday December 9 at 1:00 pm. 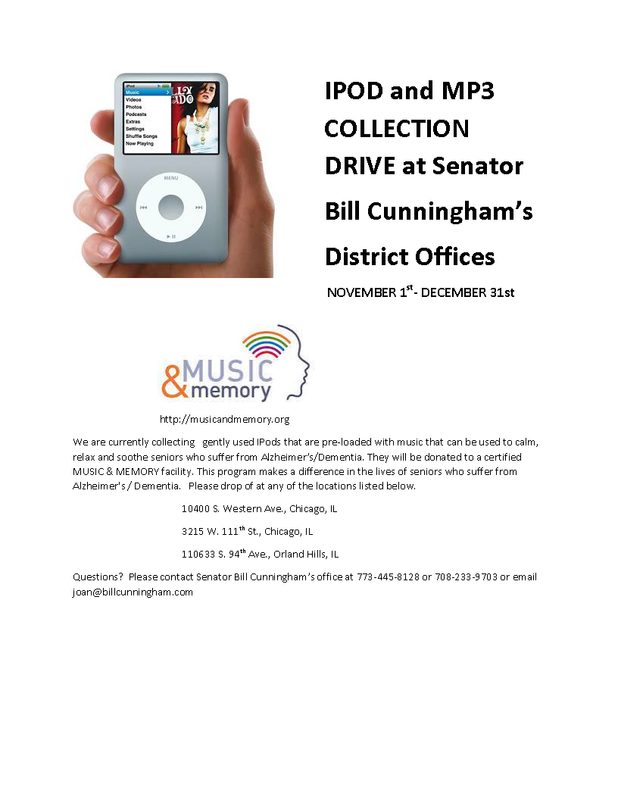 The event will be at the Worth Township Office at 11601 S. Pulaski Ave. Alsip, IL. 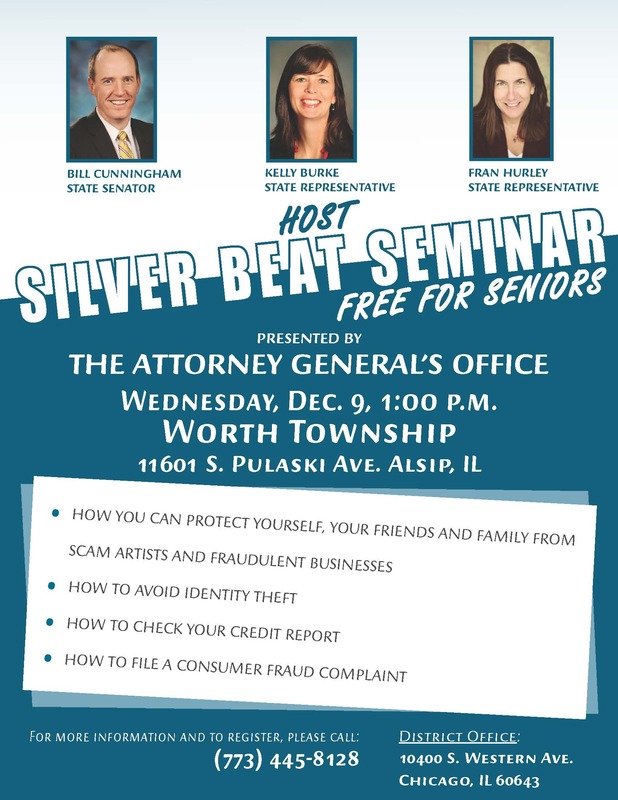 The Silver Beat seminar is an educational training program created by Illinois Attorney General Lisa Madigan to ensure that seniors have the knowledge and tools they need to better protect themselves from con artists and deceptive business practices. For more information or to register, click the flyer to the left or call (773) 445-8128. 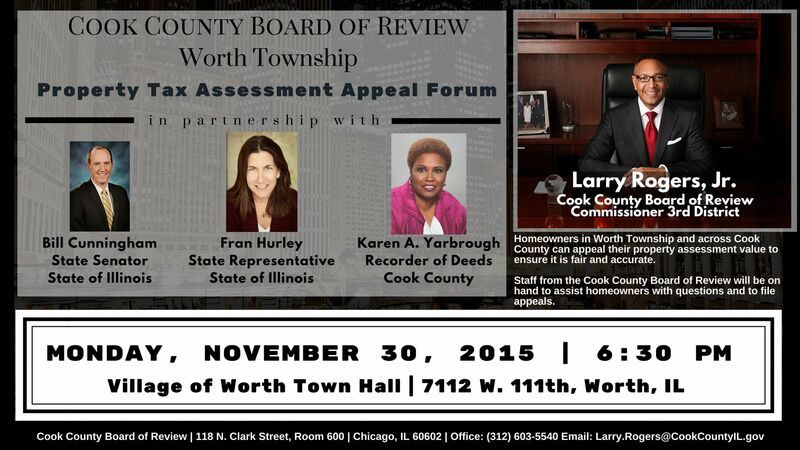 CHICAGO- State Senator Bill Cunningham (D-18th Senate), State Representative Fran Hurley (D-35th District), Karen Yarborough, Cook County Recorder of Deeds, and Cook County Commissioner Larry Rogers Jr. will hold a Property Tax Assessment Appeal Forum on Monday, November 30th starting at 6:30 pm at the Village of Worth Town Hall, 7112 West 111th Street in Worth. Homeowners can appeal their property assessment value to ensure it is fair and accurate. Staff from the Cook County Board of Review will be on hand to assist homeowners with any questions and to file appeals. Bring a copy of your tax bill or property index number. Residents of Worth Township can file an appeal through December 8, 2015.